First check that they are working properly - do this before spending useless hours tuning them - because once you get them sliding properly all the setting can change! Check both forks are working the same - no static friction. 90% of all bike front suspension problems are too much fork friction. "Here's a systematic way to go about tuning out static friction. To make sure the forks are actually parallel and that the triple clamps are not twisted, sight down the forks from the top to the front axle, and from the side across the faces of the tubes and sliders. Misalignment will be visible to the naked eye, and you should try to correct this first. Often, it is not even necessary to loosen the bolts on the triple clamps to realign the tubes. Merely squeezing the front tire between your knees and giving the handlebars a forceful twist works easily on all but the best large-diameter forks. If you're shocked at how easy it is to tweak the alignment, you'll also appreciate how common misalignment can be. With the forks aligned as carefully as you can with this technique, turn your attention to the front axle. Most axles thread into one side and are clamped on the opposite side. If you have a vernier caliper, measure the distance the end of the axle protrudes from the fork leg. Now, loosen the axle clamp bolts (if you have a fork brace loosen this as well - DH) until they exert no pressure. Next, forcefully compress the forks several times with the front wheel against a solid stop. If the forks were pinched or spread, this technique will allow them to find the position that gives the least misalignment. We found our axle had moved .018". The forks had been pinched. Now turn your attention to the triple clamps again. (these may have moved when it was tried down for transporting DH) Verify that the fork tubes both project the exact same distance through the tops of the clamps, that any preload adjusters are set exactly the same, and adjust if necessary." 38- 110-120 airgap with no spring measured from the back of the tube(tank side). First empty all the oil, take the forks of and let them stand upside down for a day. Put some 2 or 5 weight flushing oil through to get all the rubbish out -pump it up and down until the oil coming out the drain holes is clean. The put them back in and put about 250 in - pump the fork up and down to fill the airgap at the bottom and then put the rest in. Before you put the springs back in, give the fork a few slow pumps to make sure its all oil down there and not a combination of air and oil. Ride it, if it still dives with 380 in consider going to a heavier weight oil. If the fork internals are worn maybe up to 20W. Many manufacturers propose shocks for Laverda (Ikon, Hagon, Progressive Suspensions, Bitubo, etc...). However, one of the best product is Ikon (ex Koni). Surprisingly, the heavy old lump can be tuned to make it a passable cornering weapon - it'll never challenge a well ridden GSXR750 but it will embarrass quite a few average punters on their shiny new toys. 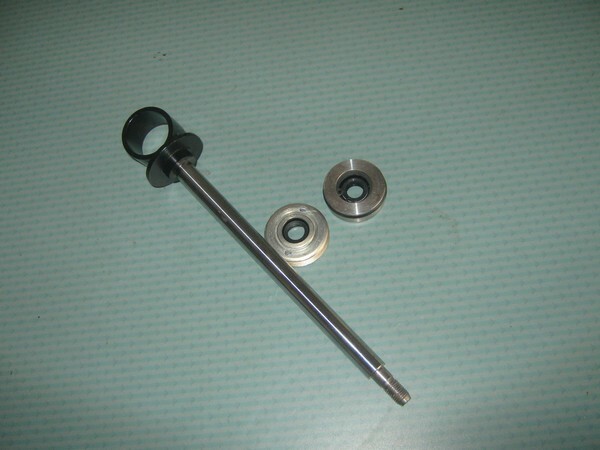 Replace the steering head spindle with a better quality one. The standard one breaks in half. Use 2 angular roller bearings on the spindle. Replace all wheel bearings and make sure they are secure in the wheel - the recesses wear oval. Replace the swing arm bushes with 2 needle bearings. Steering head 2-3mm plate braces down to the tube under the CDI and cradle tubes. Corner brace the junction of the under tank tube to 2 vertical motor cradle tubes. Cross brace the 2 cradle tubes under the oil cooler. Double brace the cradle tubes behind the airbox. Raidaly plate brace the swing arm mounts. Bend and weld on a lower swing arm hoop then plate brace the front. First check that the forks are working properly; most old forks dont! Do this before spending useless hours tuning them. Pull them apart and make sure they are assembled as the designer intended. Flush out all the rubbish before filling them with expensive fluid. While you have the forks open - check the bores, flapper valves, sliders and rod for wear. Replace as required and put in new seals. Make up some top nuts that have a recesses for preload spacers. Until you have the right preload length; make the recess dimensions to suit some cheap and nasty washers. Fit a fork brace (unless you have a M1R fork) - Telefix or equivalent. Move your calipers to the rear of the fork. Fit a set of RaceTech Gold valve emulators (or perhaps an entire TechnoFlex cartidge with compression and rebound adjustment). Tighten up the clearances between the flapper valve and the damper rod. Now fill them with dedicated fork fluid. Do not use oil or ATF! These will aerate and foam badly under severe use. Synthetic fork fluids will will last longer at high temps; and they will get hot on bumpy roads, and so they will keep their designed viscosity - read damping. Some good fork fluids are: Motul 10W-15W, Bel-Ray HVI 10W or Ohlins #10. Make sure they are filled to the right and same level. The "spring out" air gap should be around 110-140mm from the back of the fork when it is in the clamps. Pump the forks a few times during filling to ensure there are no air gaps to misleed you. The weight of oil used will depend on the wear in the fork and the machined clearances. Now make sure they slide properly - no static friction. To test for stiction - put the forks in the bike and fit the brace and wheel. Press down on the front end and release. Measure the distance from the wipers to the lower triple clamp. Next, lift and slowly release. Measure again. The difference between the numbers is stiction. 10mm is average; zero is ideal. Make sure the forks are actually parallel - measure the gaps at a few points between the bottom triple clamp and the seal. Make sure the triple clamps are not twisted. Loosen the bolts on the triple clamps, the mudguard, the fork brace and the axle. Compress the forks several times. If the forks were pinched or spread, this will allow them to find the position that gives the least misalignment. Do this every time you work on the forks or have the wheel out. Set the fork tubes so they both project the exact same distance through the tops of the clamps. Another way to do this is to put the bike on the main stand, remove the top nuts and springs. Lift the wheel up until the forks are compressed and let the wheel go. The mass of the wheel, oil and sliders should pull the forks down. If it does not undo the wheel axle clamp bolts, the fork brace and the triple clamps and twist the stanchions around until the do slide freely. If you cannot find a sweet spot; replace seals, clean wipers and look for bent stanchions. Fitting one of these keeps the forks parallel around the seals. This will help reduce stiction. Having the caliper in the standard position has to add to the bending force mid stanchion - stiction. It will also try to reduce the trail by pushing the wheel under - tucking. Neither will help handling under brakes. They were put there in the days when cooling big cast iron discs was a problem. Move them to the back of the slider. The ideal position is to have the centreline of the caliper level with the wheel's centreline. The forces from this arrangement counter act fork dive so help compression damping and also will increase the trail slightly. Both will help in being able to carry brake later into the corner. The rate of a progressive spring increases with the compressing force. So the spring gets stiffer as it compresses more. Most progressives actually work as a 2 stage spring - soft then hard. Tuning for the right stiffnes at the right time would be interesting and would change when you added or subtarcted some fluid. Here in a quote from RaceTech's web page that says it better than I can: "In order to make sense of progressively wound springs you really have to map out the force as you compress the spring. For example a spring marked 20/40 lb/in may start out at 20 lbs/in in the first inch but where does the 40 refer to? It might be referring to the rate in the 4th inch or it could be referring to the rate in the 6th inch. This would cause a huge difference in ride. Progressives are ok in a modern highly tuneable fork but questionable in an old damper rod fork with no way of adjusting rebound damping; so you may well end up with pattering using progressives. Put in the standard spring unless you have new or refurbished internals and are using a thin fluid - less than 5W. Then if you need a change, first put in more fluid and then get a heavier straight spring. I would recommend pulling the stanchions up through the triple clamps at least 15mm. This may cause a problem with the Jota or RGS style bars. The SFC is ok as it has clipons. Trash the existing shocks. Recommended modification: Move the top mount forward to the junction of the cradle tube and brace to suit. Get a set of rebuildable shocks ie: Ikon 7610-1397 (the old Konis) or a set of adjustable length gas shocks - perhaps some Ohlins 36PRCLBs or TechnoFlex Stereos. If you have a rebuildable set; rebuild them - new seal, O ring and some good fluid. The first step to setting up any bike is to set the spring sag and determine if you have the correct rate springs. Spring sag is the amount the springs compress between fully topped out and fully loaded with the rider on board. Overall sag and front-to-rear sag bias will depend on chassis geometry, track or road conditions, tyre selection, rider weight and riding style. Lift the front wheel and extend the fork completely. Measure from the wiper (the dust seal atop the slider) to the underside of the bottom triple clamp. This measurement is L1 - top out length. Tie a cable tie around the stanchion between the bottom triple clamp and wiper. Take the bike off the stand. Get an assistant to balance the bike from the rear. Get on the bike and assume the normal riding position - if you are setting up for a long ride with a pillon or luggage - put this on the bike. Push down on the bars as if you were braking heavily. Relax. Measure the distance between the cable tie and the wiper. This measurement is L2 - bottom out length. Lift up on the front end and let it drop very slowly. Where it stops, measure from the cable tie to the wiper again. This measurement is L3 - friction length. L2 and L3 are different due to friction in the seals and bushings, which is particularly high for damper rod forks. Halfway between L2 and L3 is where the sag would be with no friction. Therefore L2 and L3 must be averaged and subtracted from L1 to calculate true spring sag. Static spring sag = L1 - [(L2 + L3)/2]. Set the front up by putting in enough spring preload spacers - use a washer stack until you have the right height then machine up a piece - get both sides the same. OEM spacers can be 20mm different!! The right height is about 15% of total travel. This depends on the bike set up (has the overall travel been modified?) and riding style. The lower the sag the quicker you'll be into damping - ok for the track but a bit uncomfortable on a long touring ride. If it still sags with say more than 50mm of spacers; go to a stiffer spring. Too little sag - reduce preload. Fork stiffens up after a short amount of travel. Tyre skipping - especially a hard side tyre like a Michelin Macadam. Losing front end (radial tyre) on corner entry . Too much sag - increase preload. If everything touches on cornering. If you hear clicking from the forks when you suddenly power up. Forks compress too far on smooth turns. Load the bike to how you will ride it. Think really carefully about putting all your movable furnishings above and behind your rear axle. The effect is not noticable on a Harley but a normal bike's suspension (not to mention the tyre loading) will be totally screwed up doing this. Get a tank bag, stronger girl/boy friend or travel lighter. First set the wheel adjusters so the wheel axle is exactly parallel to the swing arm axle. Extend the suspension completely by lifting the wheel off the ground. It helps to have a few friends around here. Measure the distance from the wheel axle to the centre of the shock top bolt. Do both sides. This measurement is L1 - top out length. Take the bike off the stand and put the rider on board in riding position. Have a third person balance the bike from the front. First, push down on the rear end as far as you can and let it extend very slowly. Where it stops, measure the distance between the axle and the bolt centres again. Do not bounce! This measurement is L2 - bottom out length. To get the actual sag figure you find the midpoint by averaging L2 and L3 and subtracting them from L1. Static spring sag = L1 -[(L2 + L3)/2]. Adjust the preload by turning the spring collars. Rear sag is typically 15% of total travel. If you cant get the right sag ; go to a stiffer spring. Wheel skips sideways in the bends, especially on bumps . Bike squats under acceleration especially in a corner . Foaming on bumpy roads . This is the damping that happens when you first hit a bump - it hopefully stop the forks from banging down to the stops and trying to jar the bars out of your hands. The bumpier the road, the better you want your compression damping to work so that you are not kicked off the bike. It is set by altering one or some of the following: Air gap/oil volume. It will not alter the damping directly. Note also changing the oil viscosity changes the damping. For both the compression and rebound. Adjusting your brand new emulator or cartridge. This is the damping that happens after you have hit the bump and it "lifts" the bike back to its sag position as quickly as possible. The faster you go, the better you want your rebound damping to work so it can keep the wheel in contact with the ground. The size of the gap the fluid flows through Fluid's viscosity. This is the major limitation with damper rod fixed orrifice "velocity-squared" damping forks like we have. As there is no adjustment on compression or rebound; the faster the wheel moves up, the more fluid is shoved through the holes. So the steeper the bump, the faster the suspension moves. Not related to speed of the bike at all! But the bike speed does matter: if you double the bike speed over particular bump, you will double the vertical wheel lift velocity. If the vertical lift velocity is doubled, the flow rate through the damping holes is doubled. So over a series of steep bumps it can do what motoxers call "pump up" and get progressively harder. The only alternative is to fit a cartridge or at least an emulator. Setting the following up as best you can will make it a bit better. Have no stiction correct set up for basic damping lighter fluid fill with the best fluid you can lay your hands on adjusting the spring pressure on the emulator valve stack. All that you can do is to set the airgap and use the right fluid. There is no adjustment. Replacing the old worn out parts will reduce the gap that the fluid has to pass through which means that a lighter fluid can be used - this will improve the compression and rebound response but not their limits. So fit a Race Tech Gold valve emulator. These will reduce the front-end dive especially when braking. This lets the suspension do what it was designed to do - absorb bumps. The emulators are adjusted by setting the valve stack spring pre-load. Increasing the pre-load will stiffen the fork during compression, but has no effect on rebound. Test by braking on a normal road with normal tyre pressures. If the front dives or uses up all it's travel under braking, increase the damping by adding 5mL of fluid per leg until it does not bottom out. Now move to a bumpier road and test again. The forks should bottom over the worst bumps only. Now go to a bend and test. Under full brake - with the back wheel getting really light or even a little off the ground, you should still have damping going - you should still "feel" the road and have control. If you cant get good enough damping without putting so much fluid in it locks up the forks ; then put heavier fluid in. It is ok to "blend" the weight. Too little compression damping - screw in the emulator nut, add more fluid or increase its viscosity. A loose feel when tipping into a corner . Bike difficult to turn in . Front wheel skips on bumps. Forks judder when braking on a straight. Front end chatters coming out of corners. These are air over oil so the size of the airgap matters a lot. This is decided by you telling the tech what bike it is, masses, riding style etc. If you are rebuilding the shock or changing its design parameters by say, putting them on a lighter bike, then 90mL of 5W fluid is a start point. If they bottom out with this, increase the fluid a little (2mL) or put in a heavier fluid. If the damping goes off after riding hard over bumpy roads for a time - put in a better fluid - its aerating. Hard used; these things really have a problem with aeration and foaming so only use the best money can buy. Most shocks have a compression valve stack fitted. They can be altered but I would suggest fiddling with the amount and viscosity of the fluid first. Find a corner with bumps on the exit. Exit over the corners and progressively increase the acceleration. The back end should follow the ground - no skipping. Find some rough bumps on a corner, the shock should bottom on the roughest but it should not have a slamming sensation. Too little compression damping - add more fluid or increase its viscosity. A loose feeling from the back when powering though bends. If the back squats especially under acceleration. If the bars shake especially under acceleration. If the back starts to wallow. Too much compression damping - drain some fluid or reduce its viscosity Harsh ride over ripples. If the rear end "breaks out" especially under acceleration. Rebound damping is responsible for the stability and the cornering characteristics. It is based on the viscosity of the fork fluid and the size of the holes this fluid flows through. The desired weight of fork fluid has been covered above. The only way to improve air gap forks is to "tighten" up the tolereances around the rod and flapper valve. Chose the lightest fluid you can use and still have usable compression damping. Find a short sweeper and take it at a steady pace. The forks should compress for the turn, rebound and settle. If the forks rebound too quickly the bike will drift wide. If the rebound is too slow, the bike will tuck. With the bike turning well, the bike should return to a steady state quickly and not deflect off bumps. Too little rebound damping - increase fluid viscosity. Excessive pogo action through chicanes. Front end shakes (not chatters) in corners. Front end shoots up too fast after braking . If the forks top out even though you are using quite a bit of sag. If the front starts wallowing . If the front bobbles as you come off the brakes. Too much rebound damping - reduce fluid viscosity. Forks pump down on fast bumpy corners. Ikons/Konis have a dial 1-->4 for rebound - this reduces the hole size that the fluid has to travel through. It works ok but not great. It also has a rebound stack. For hard riding or racing I would get a gas filled remote style as these reduce aeration. Find a relatively fast straight with braking bumps leading into the entrance of a corner. Reduce the rebound damping by turning down the dial until the rear end begins to hop or feel loose. Increase until the sensation goes away. Find a bump that tends to kick the back up. If the rear end bounces up, add rebound. next impact. If it does not, reduce the rebound. Too little rebound damping - increase the dial numberor increase fluid quantity/viscosity. Rear jacks up too fast on braking. Rear end chatters exiting slow corners. Bike kicks off ripples or bounces on bumps. If the back end weaves and shakes the front. Too much rebound damping - decrease the dial number or reduce fluid quantity/viscosity. Rear end pumps down on bumpy corners . All the above will work better with radial tyres. A radial flexes more in the sidewall so it can keep a bigger contact patch on the road. This will translate into more feedback and better grip to go with your improved suspension. You can lean it more and your corner speed will increase. Some of the radial lookalikes (Avon, Dunlop, Metzeler) X plys with radial tread patterns, will work almost as well. This is a typical metric label format "110/80-18 58V". The first 3 numbers are sizes and the last 2 are normally ignored - if you go fast; dont. The "58" is the tyre's load index and should be above 58 for front tyre on this bike. A 58 LI is a load of 236kg ie:80% of the loaded bike's weight transfered to the front tyre, as in emergency braking, will not collapse the sidewall - which would add to theexcitement of the manouever. A 66 LI rear will take 300kg. That should cover 2 people at 75kg, acceleration" squating" plus if you must; your luggage. The "V" is a 240kph speed rating and a ZR above that. I limit my tyre selection to V and ZR speed rating and +58 front load index rating and +66 rear when considering the weight of the bike and possible +230kph speeds. It is possible to fit a "H" rated tyre (210kph) but if you are bothering to read all this you will most likely want to go fast so stick with a V or ZR. There are not a lot of 18" V or ZR true (0 degrees bias) radial tyres around with +58 and +66 load index ; so you wont be stuck for choice. Front: 100-110. If you go bigger, it will oversteer badly. If you find a 100/80-18 58ZR - let me know! Back: 120-130. The only rear radial that I have found in this range is the Michelin Mac90, now called 100. Its an ok tyre but needs a lot of work to bring it up to heat - European riders say it never does. I tried one. Then I tried some 150 tyres - the Michelin Mac 90 150/70 and the Bridgestone B010 150/60. The Mac measured at 158 mm across the tread and was too big; the Bidgestone was 128mm across (compared to 122 mounted on the correct width rim) and was/is great. A 3C and SFC/RGS swing arm will take a 150 tyre. I was using standard thin web rims with these tyres. Tyre pressures are far more critical to the performance of a radial than a straight X ply tyre - 1 or 2 psi (0.07-0.14 bar) either way! Buy a good pressure guage and spend time getting it right. very very carefully and watch the pressures after fitting to make sure it is not leaking. On a wire rim a sealing tape is required. Cast rims cracking - I have cracked 3 thin web rims mid spoke - 2 back and 1 front. Was this the higher lean angles/higher grip/higher corner speed all increasing the mid spoke bending moment leading to failure? Yes, I think it was. I have now put some late 1980s GSXR 18" rims on - right width, stonger casting and they look ok too. Here is a list of some (probably not all) 18" V and ZR radial tyres of suitable width, speed and load rating. References: Information from the following webpages was used in the preparation of this paper. the specialist Wolfgang Haerter had remanufactured a whole kit including a new rod with usual size, seals and rings. The whole kit costs about 100 Euros.